This medallion with ring is made by Hans Reinahrt the Elder in Germany in 1538. Hans Reinhart the Elder (ca. 1500/10 - 1581) was a German goldsmith and medallist working for the Court of Saxony in Dresden. 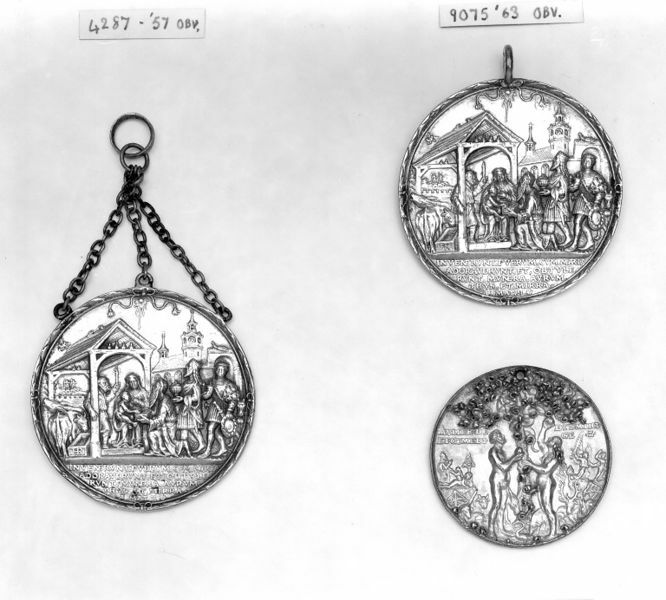 Reinhart's medals, mainly produced between 1535 and 1545, were marked with his initials hr. It is worth mentioning that he cast his medals from wooden models and not, as was usual in goldsmith work from stone models. His work as medallist is not extensive, Habich lists fewer than 50 medals. They saw the young child with Mary his mother, and they fell down, and worshipped him: and when they had opened their treasures they presented unto him gifts; gold, and frankincense and myrrh. Matthew 2. Bought in 1863 for £1 10s. 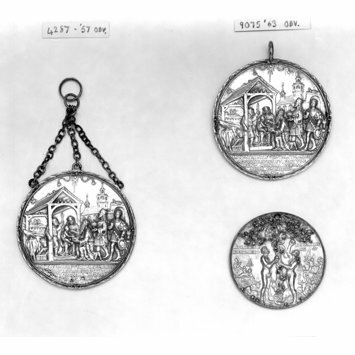 Medal, silver gilt, The Adoration of the Magi or Moses and the Burning bush, by Hans Reinhart the Elder, Germany, dated 1538.